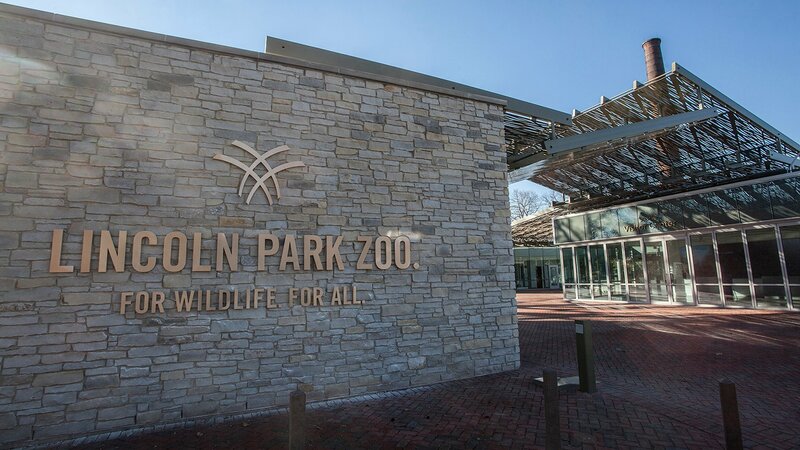 Lincoln Park Zoo on Thursday unveiled a new $9.3 million visitor center that it says will provide additional comforts and services for its 3.6 million annual guests. The new Searle Visitor Center features a movie theater-sized screen highlighting daily programs, a series of curated gardens and the zoo’s first member center, a “quiet place to take a break while enjoying specialized services and exclusive programming” for paid members, according to the zoo. The center will also provide members a “one-stop shop” for donating to the zoo by “adopting” an animal or purchasing items from the zoo’s animal enrichment wish list. All guests can visit the center to pick up a map, rent a stroller, borrow a wheelchair or grab a “sensory bag” filled with soft, squishy objects that can help children engage their senses while exploring the zoo. The center also also includes quiet spaces for nursing mothers or those with sensory concerns. Ross Barney Architects led the design of the building, which combines white brick with floor-to-ceiling glass windows and a series of modern-looking angled roofs. The new center also marks the return of the Adelor lion statue, a favorite among zoo guests that now sits in front of the building. The building was constructed using repurposed materials and includes a green roof, energy-efficient heating and cooling and permeable pavement. Given those features, the zoo is seeking certification for the building through LEED, or Leadership in Energy and Environmental Design, the most widely used green building rating system in the world. The new visitor center was funded by donations from the Searle Funds at The Chicago Community Trust, the zoo’s Women’s Board, the Crown family and Gordon and Carole Segal.